Prototype: Class 1200 heavy general-purpose locomotive. The locomotive is in the basic blue paint scheme with yellow stripes for the privately owned railroad ACTS, used on the Dutch State Railways (NS). 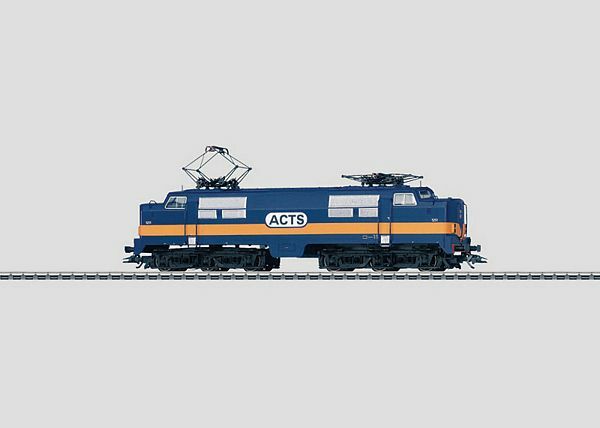 Model: The locomotive has an mfx digital decoder, controlled high-efficiency propulsion, and a sound effects generator. 2 axles powered. Traction tires. The headlights are maintenance-free, warm white LEDs; the marker lights are maintenance-free LEDs. They will work in conventional operation and can be controlled digitally. Brake hoses can be mounted on the buffer beam. Length over the buffers 20.8 cm / 8-3/16. This model can be found in a DC version in the Trix H0 assortment under item no. 22149.